Visually awesome stuff for promotional activities. 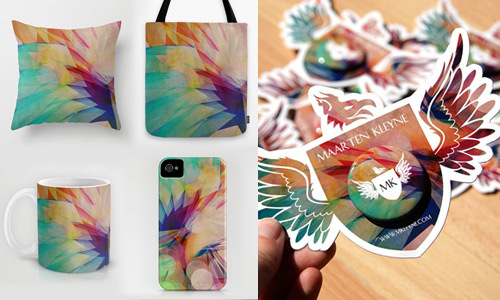 Need a unique merchandise design to help promote your record, film, another type of product or your company? You can hire me to create various merchandise designs. Contact me for a free chat; no strings attached. Merchandise can be great visual and tangible extra’s you can spread amongst your target audience. To promote your music, film, your company or to go along as little extra goodies for someone who bought your product. You want to hand out something unique. Something visually awesome that fits with you or your company/product. Right? That’s why I strive to create unique and fitting merchandise design. From buttons to throw pillows and more. Let’s talk and see if I can create something visually unique for you.